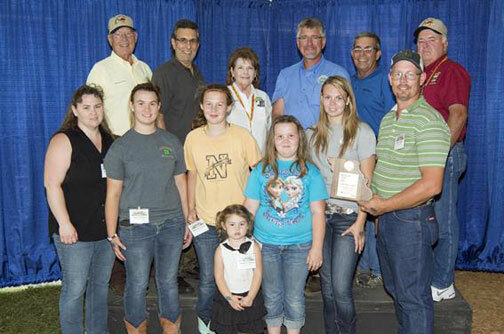 Mark and Jennifer Eckstein along with their family of Beaufort, Mo were among the 110 families honored during the Missouri State Fair’s Farm Family Day on August 11, 2014. The Eckstein’s were selected as the Franklin County Missouri State Fair Farm Family by the Franklin County University of Missouri Extension Council and Franklin County Farm Bureau. The family includes: Mark and Jennifer, and their children Velma, Hanna, Mathilda, Madeline and Marcella. Each year, the fair sets aside a day to recognize farm families from across the state who are active in their community, involved in agriculture, and participate in local outreach and extension programs such as 4-H and FFA. Jefferiesburg 4-H Club and Union FFA. Mark currently serves as a member of the Franklin County University of Missouri Extension Council. The annual event was sponsored by the Missouri Department of Agriculture, the Missouri Farm Bureau, the Missouri State Fair, the University of Missouri College of Agriculture, Food and Natural Resources, and University of Missouri Extension.